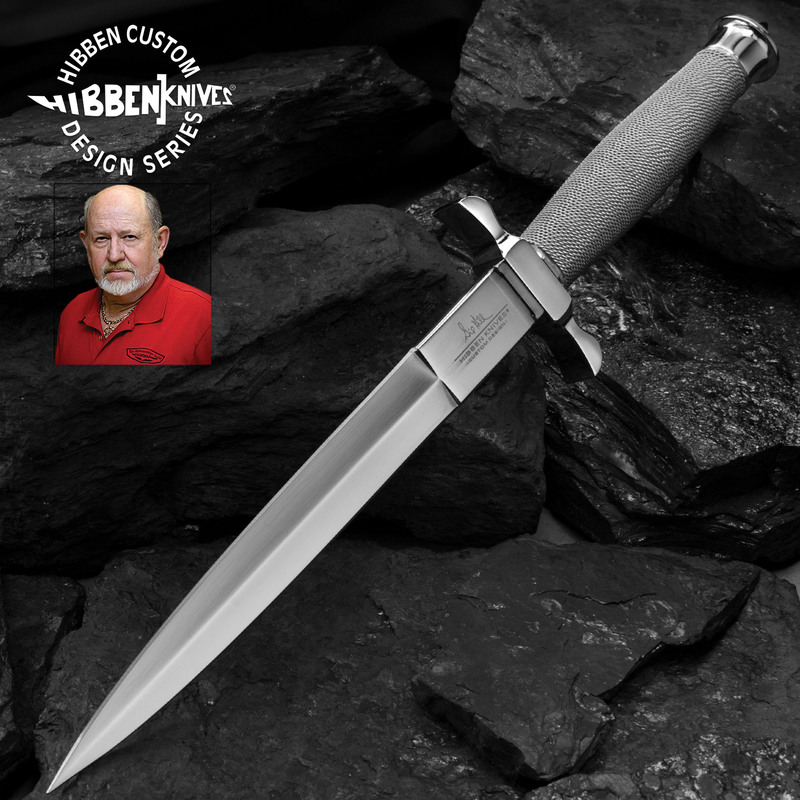 This superb design is the single blade shadow knife by renowned knife designer Gil Hibben. Measuring 12 1/2" overall, this distinctive item features a 7 1/2" mirror polished, 420 stainless steel blade. The hilt offers a handle with silver wire wrap that provides a sure grip. This knife includes Gil Hibben"s personal stamp etched on the blade and a custom, genuine leather sheath. The dagger, a stabbing weapon that does NOT have to be razor sharp to do its job, is one of the best "fantasy" pieces Gil Hibben or anyone else has ever made. Its clean, sleek lines are timeless and it will look just as sweet 100 years from now. The eye isn't overwhelmed by an excess of metal that serves no purpose but to distract and hopefully create a WOW factor. I am in the process of ordering two complete sets ( Bowie knife, Dagger, Silver Shadow ) for my grown sons so that they can see how real knife work can be done without going crazy with the design. Truly masterpieces fit more for a display case than use. 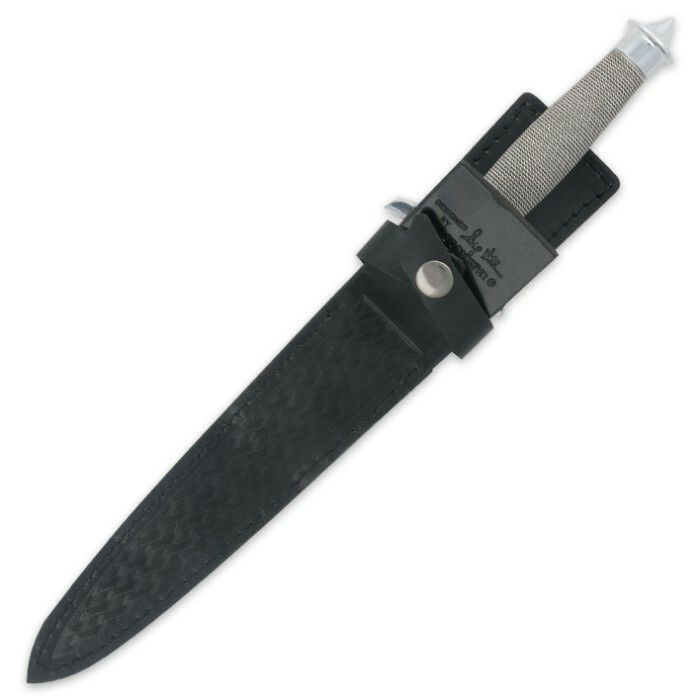 Dudes, get off the cool aid train, You might want to consider another hobby than knives if you keep whining about the edge not being razor sharp, this particular knife is a "DAGGER". It is NOT meant to cut and slash, totally wrong type blade for that! This is a "STABBING" knife! jeez people, do some research. this is a true work of art. artistry in steel. love it. I consider this a Dagger as with the Silver Shadow Dagger. Again , it is a beautiful blade, meant more for piercing and stabbing rather than slashing or cutting. I Love both of these blades, they look great and feel great. Although this one has a little more of a refined edge than the "dagger" version, it is still not a razor sharp blade, it will cut, but it isn't meant for slashing. 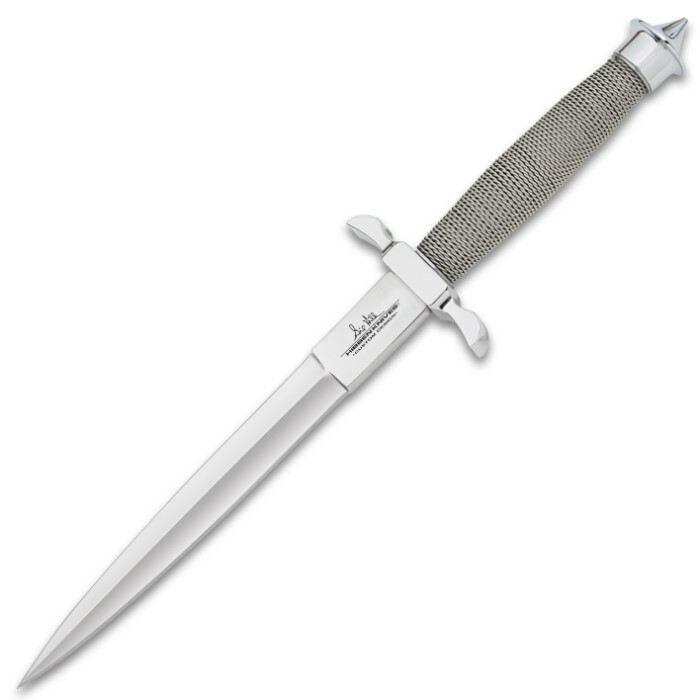 Gil Hibben's products are great. My Silver Shadow fell off the wall several times, and imbedded itself into the floor without damaging the point. Couln't ask for more in a dagger. Love the silver polished look to it. A ust buy at a good price. (I also paid $39.98 for mine). Get one while they last! This knife exemplifies quality. It is hefty and well balanced, as well as beautiful. The same can be said for it's smaller cousin. I have them both. I received my Shadow Dagger today and was impressed with the quality from a Chinese made dagger. The guard is not very tight and the leather is a little dry. I took care of the leather with neatâ€™s-foot oil the guard I will look at tomorrow. As others have mentioned, it isnâ€™t very sharp. To that I say buy a knife as a dagger is a stabbing weapon a knife is a cutting tool. Great looking and balance, well worth the price. Returned 1st one due to loose hilt. Return was easy and the folks at BudK were very friendly and helpful.Great knife and great experience. I own a number of Gil Hibben's knives and have never been disappointed. This knife is no exception. It is definitely a great addition to anyone's collection. This is a very pretty knife, but quite dissapointing in that it is quite dull as it comes, except for the point. I tried a carbide sharpener (item #40FP1) on it and it just produced curls of steel without sharpening the knife at all.